Incredible towing and wrecking/salvage yard business opportunity complete with 1993 rollback tow truck, 5 acres of heavy zoned industrial land which is grandfathered so can be used for any business to the buyers discretion. Approx 1 acre fenced w/ 8 ft commercial grade chain link, 20x30 work shop, separate office w/ attached studio. Located with in miles of the interstate for easy access for calls. There is an older manufactured home and an additional home site with septic and water/electric hook ups. You can have your workers live on site for quick turn around on tow calls. The zoning allows owner to sell parts, as well as a wrecking yard. 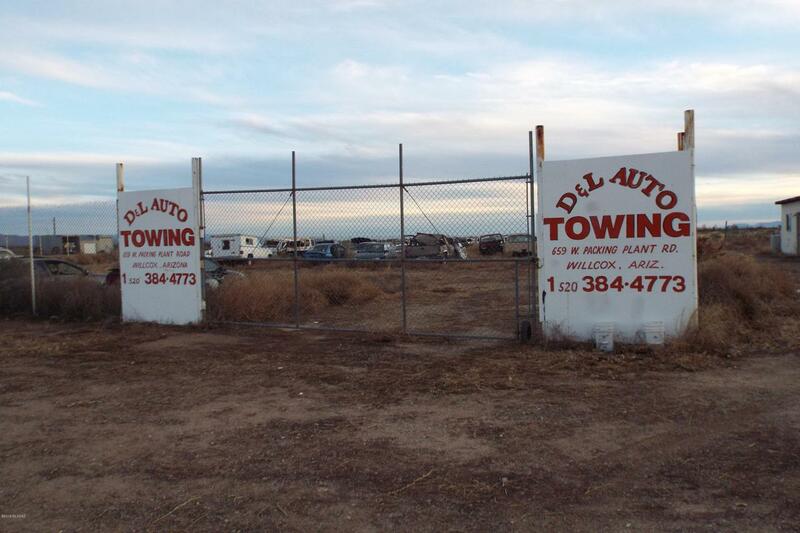 This is the only wrecking yard located in Willcox where you can sell parts!! All cars stored now will convey with the sale, as well as many tools.